This is a series of post in which have have been discussing the new features of WPF 4.5 RC. 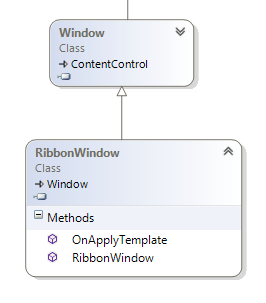 In the last post we started our discussion of Ribbon feature in the framework. I have been Ribbon as a new feature because it is a lot more than a control. With the Selector control for Ribbon, it has introduced a lot of other controls including RibbonButton, RibbonComboBox inheriting from the base ContentControl(s) like Button and ComboBox. In this post we will be discussion Quick Access Toolbar and RibbonWindow. Toolbars have historically been used to group together frequently used commands in a desktop applicaiton on Windows Platform. They have been provided to provide ease in the use of the system. They can also be used with the ribbon. Here it is called Quick Access Toolbar. Although we can add / remove items from the Quick Access Toolbar, we can also provide users the ability to modify the toolbar by adding or removing items from it. Although Quick Access Toolbar is a part of Ribbon, it can be displayed on top or bottom of the ribbon. We can also display it on application title bar by using RibbonWindow instead of regular WPF window. Quick Access Toolbar is displayed irrespective of the ribbon tab selected. If the quick access toolbar is already displayed on bottom of the Ribbon then user can always move it back to the top. In the following example we are adding a Quick access toolbar to our Ribbon control. The toolbar has two buttons hosted inside a DockPanel. As we learnt before, we need to set the Label property of the button instead of WPF Button where we set the Content property to set the text displayed on the button. Ribbon Control is a Selector control which can be hosted in a regular WPF Window. But there are benefits of hosting it in a RibbonWindow. You clearly can see that there are controls added in the non-client area of the Window. This is Title bar. Historically we have just seen Title property which can only be assigned with a string value, and that's it. Basically we can achieve the same behavior by using RibbonWindow instead of regular WPF window. RibbonWindow allows the Quick Access Toolbar and Contextual Tab Headers to be drawn in the non-client are of the title bar. If we set the title on RibbonWindow and Ribbon both, then the title set on the RibbonWindow is preferred for display by the runtime. In the following example, you can have a look that we are setting both of these properties.